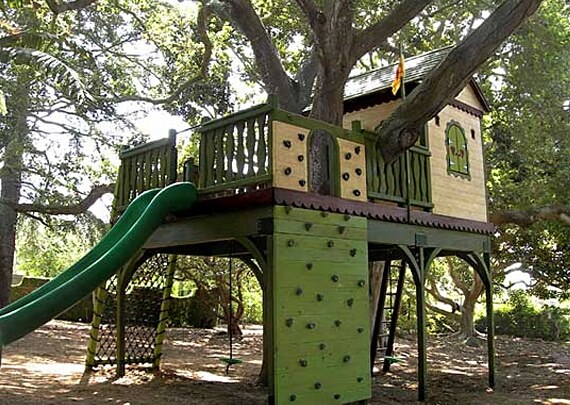 Having an awesome tree house in the backyard is the ultimate childhood fantasy. A super neat space built just for you and your homeboys and homegirls makes you the coolest kid on the block, all while providing hours of outdoor fun. Even something as simple as a plywood box with a door and a window works. 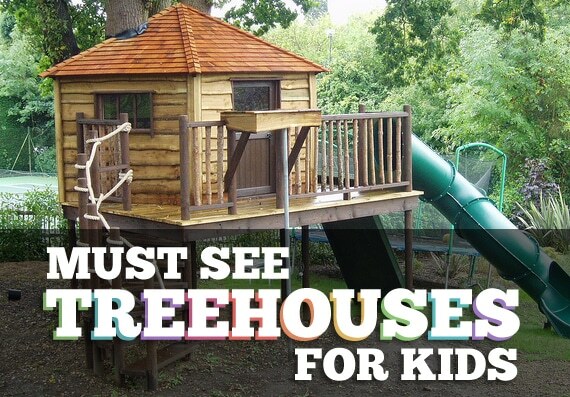 Though if you’re thinking of something a little grander for your little adventure seeking offspring, you can’t miss this list of Must See Treehouses for Kids. 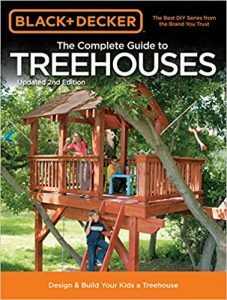 IMPORTANT RESOURCE: Before we show you some awesome designs of treehouses for kids, we highly recommend the complete guide to designing and building a treehouse. 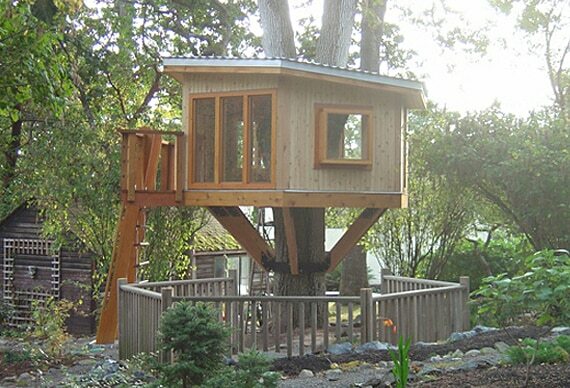 It is the leading book for designing a kids treehouse, complete with step-by-step details and full plans. 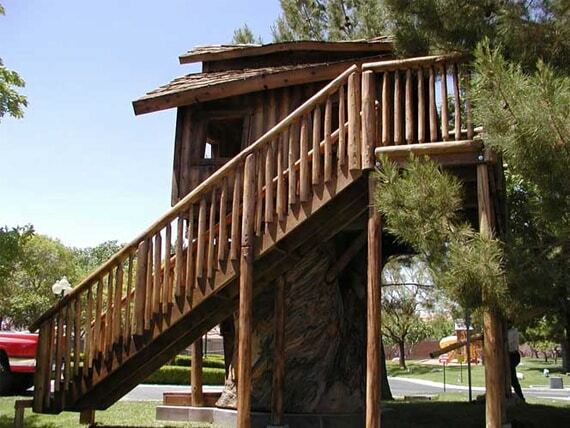 It includes important not to be missed details on securing the structure to multiple trees, ensuring that it is safe. It’s important to know exactly what you are doing before starting the build. See the latest customer reviews today. 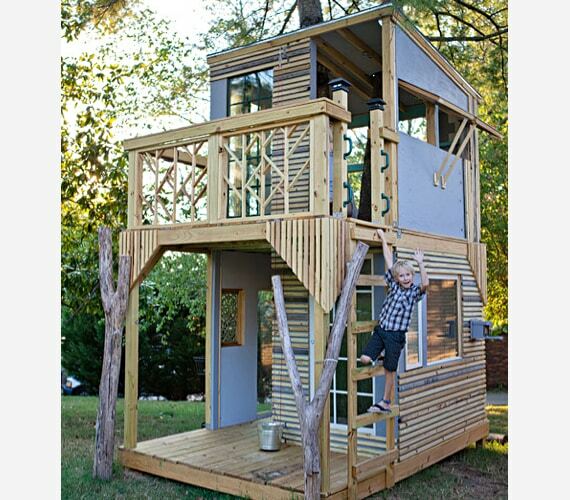 YOU CAN BUILD THIS TODAY! 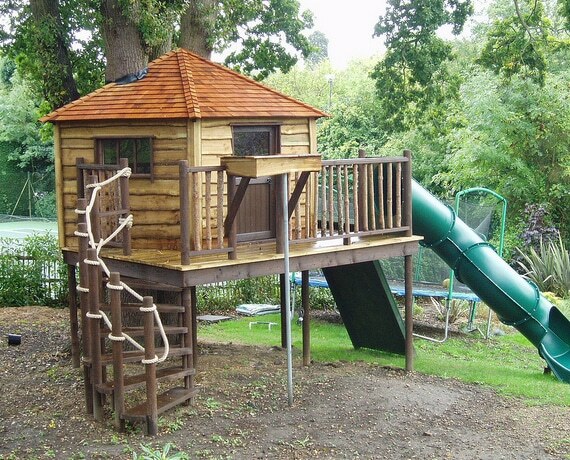 Talking of mini playgrounds, this kids clubhouse and lower play deck with swings is the most popular backyard playset around. It has a really methodical layout for building and most importantly its sturdy. 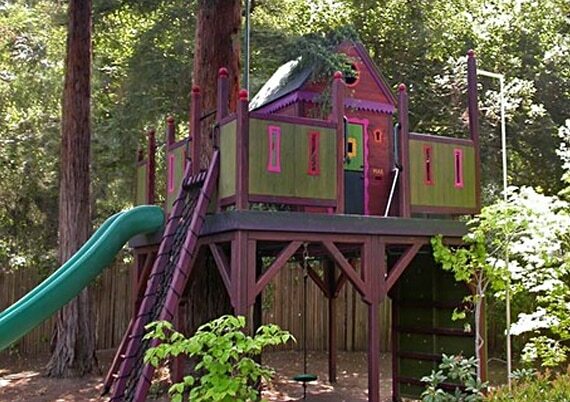 The kids will love it as it will provide hours and hours of fun-packed adventures. 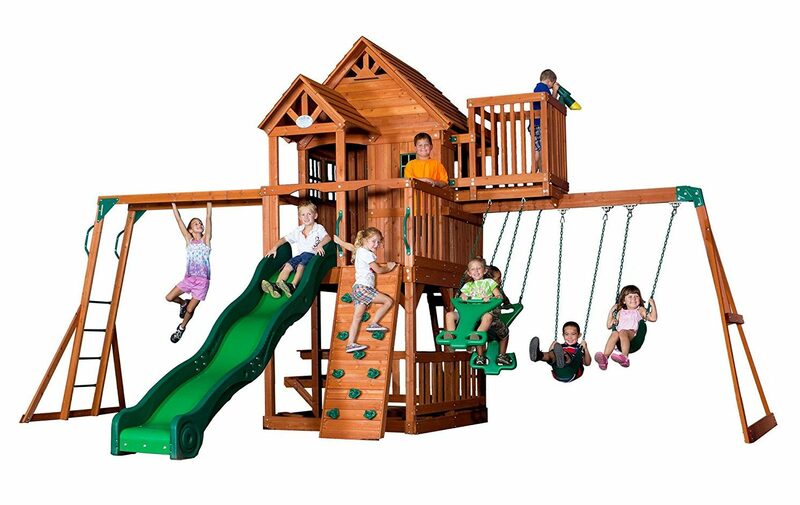 See why customers love this playset. Where do you play when Celine Dion is your mom? Here! This chic white chateau was designed with Celine’s 10-year-old son and her many nieces and nephews in mind. 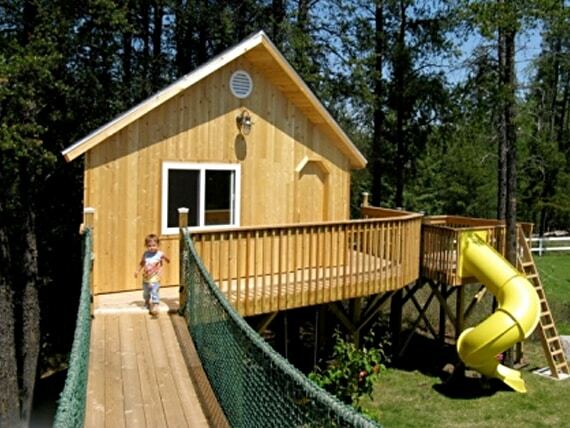 This hideaway has a Hansel & Gretal, lost-in-the-woods feel that adventurous kids will adore. Charming and shabby, it blends in so well with the brush, they just might want to leave a trail of crumbs behind. Ewoks invading your garden? Building an AT-ST fort should take care of all that. 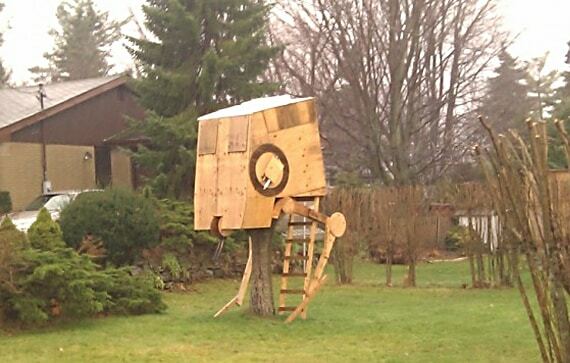 The Star Wars-inspired creation may not be as fancy as the rest, but it sure is one of the geekiest treehouses for kids! 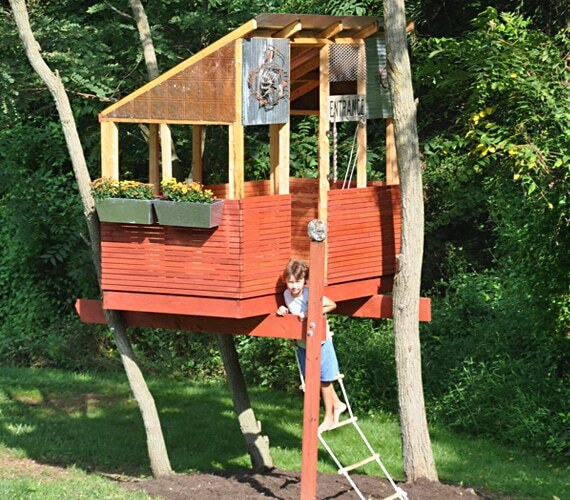 Ever wonder what a human (little human, at least) sized birdhouse would look like? Wonder no more, because we think this is it! Designed by John Rattenbury in 1967, this recreation features neat, hexagonal portholes for bird watching, of course. 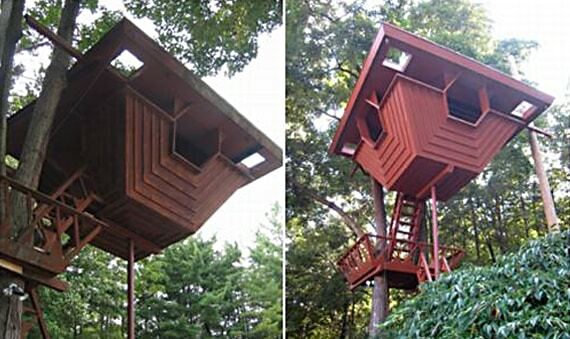 If Frank Lloyd Wright had been in the tree house business, his design might have looked something like this. Perched up high, and making use of the play space below, its floor to ceiling windows are great for soaking up some nature. Short on outdoor space? 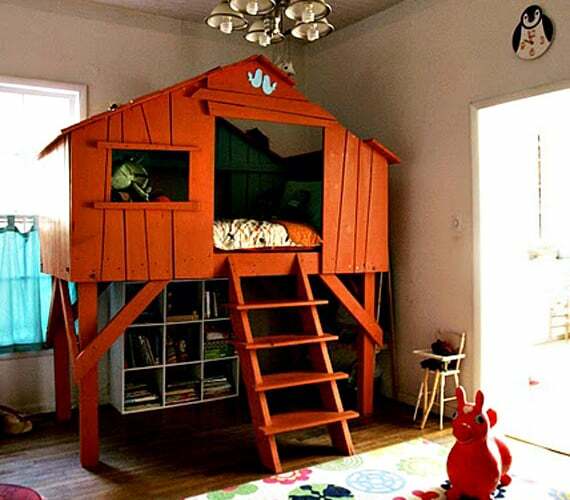 This tree house bed for kids will make up for that. 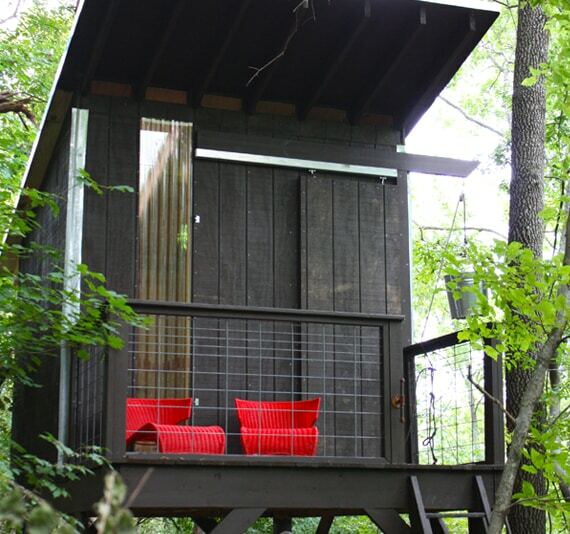 A full-time, all-weather hideaway, right in their bedroom? It might even score you some extra time for sleeping in. 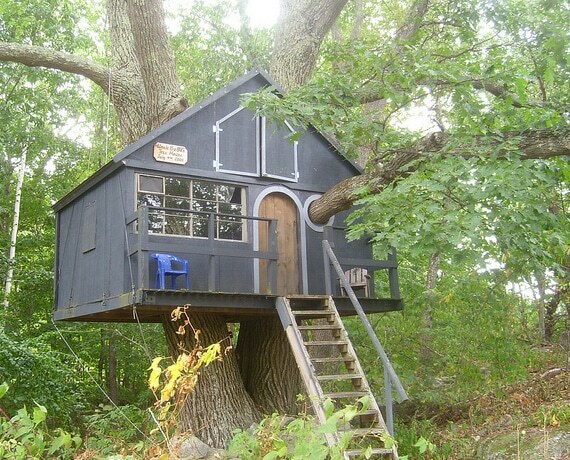 Need more treehouse inspiration? 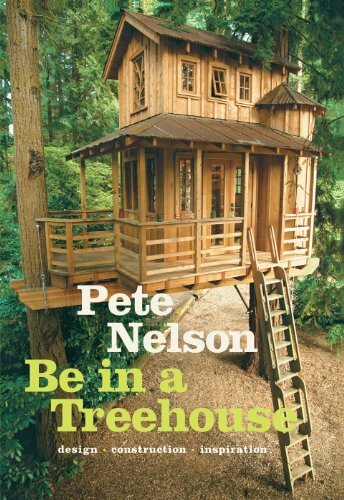 This book by Pete Nelson (the world’s most well-known tree house designer) documents some ultra-cool treehouses from around the world, mostly built in the USA. The book has fantastic reviews and is well-worth reading if you’re needing a new design idea to kick-start your build. Read the amazing customer reviews. 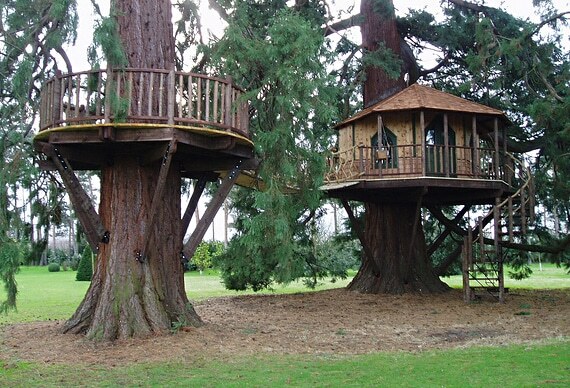 Must see treehouses for Kids and childrens treehouse designs / ideas. A simple plywood box with a door and a window works, but these are much grander! 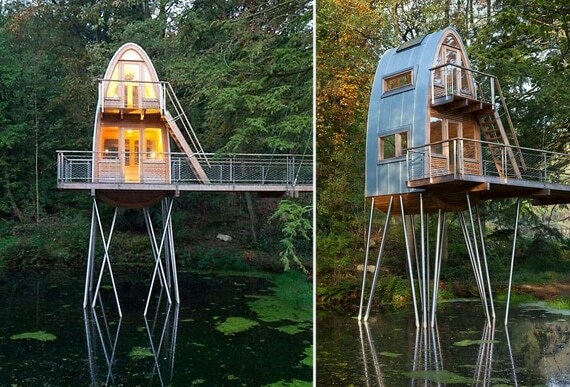 Very cool tree houses. These look so fun. 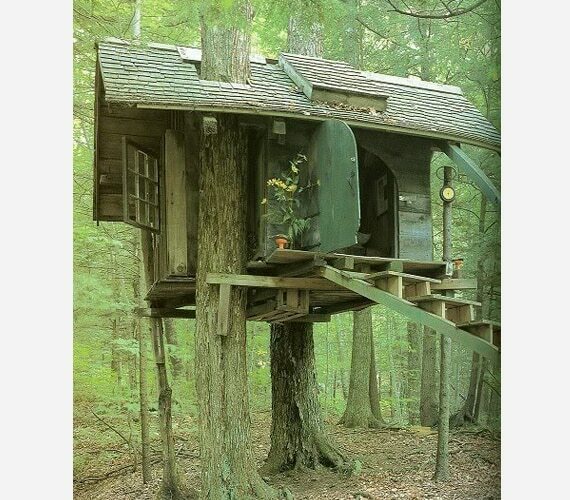 I looked at treehouse number 11 and i was like,”I want that house so bad,its so actual house looking” as you can probably tell from the comment I’m a kid too. Just a very intelegent kid with an e-mail account. wow. 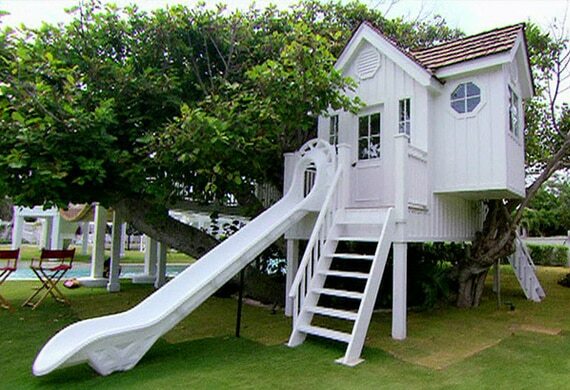 I am a teenage immature and as you can possibly tell, I am so gonna build one. 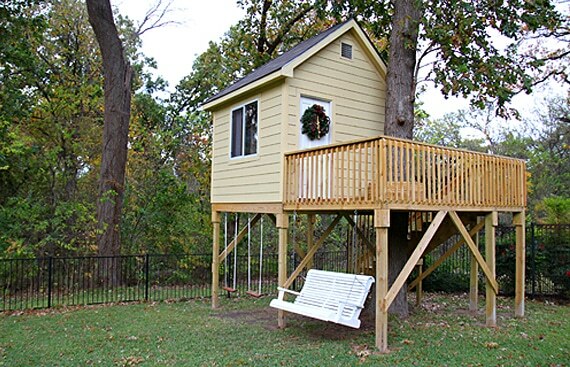 but I am going to build 1 with a zip line going from one tree house to another. then have a hammock and party lights to make it look kinda redneck.lol. it would look so cool out in the pines. some where to release stress from my little brother…..